The City has placed dispensers in active parks and dog beaches for residents to use when they occasionally forget to bring their own bags. Dog owners have the responsibility of supplying their own bags and removing dog excrement under the Litter Act 1979 and should always carry a bag with them when walking their pet. 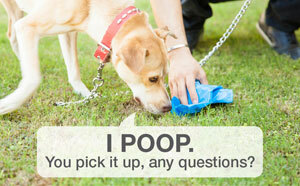 Leaving dog poo in public areas such as streets, parks and on beaches can all incur a fine. Under the Litter Act 1979 you can be fined $200 for not cleaning up after your pet. All parks listed below now have dog waste bag dispensers. Residents should also note there are almost 1000 bins in over 280 parks across the City and any of these can be used to dispose of used dog poo bags.